Kevin Pierce of Anacortes in a festive mood at the '09 fest. Despite the first day of winter not arriving until December 22 this year, winter seasonals have been on retailers’ shelves for some time now and some of the weather we’ve had definitely fits the bill for the coldest and wettest season of the year. So, it should be no surprise that the annual Winter Beer Fest is back, with a wide selection of winter seasonals, special one-off beers, barrel-aged specialties, and more. This upcoming weekend, thirsty beer drinkers will pack into Hale’s Palladium to sample what the region’s brewers are pouring this year. The festival will take place at Hale’s Palladium this Friday, December 2, from 5pm to 9pm, and Saturday, December 3, from Noon to 9pm. Tickets are $23 in advance and $25 at the door if they are still available, and admission includes a tasting cup and six five-ounce beer samples. Additional tasting tokens are available for $1.50/EA. There will be at least 30 Washington breweries pouring at least 70 different beers. Here is a link to the most current full list of beers for the festival. There will be a lot of great beers, but following are some suggestions that are worth targeting or sound intriguing. 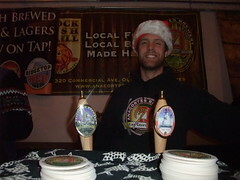 Big Al Winter Warmer – This is probably my favorite local winter warmer. Just a beautiful, drinkable blend of caramel and chocolate with a smooth alcohol warming. They’ll have the fresh 2011 version, as well as some vintage 2010. Northern Lights Frankin Imperial Stout – A 9.5% ABV Imperial Stout from a well-respected WA brewery whose beer we rarely see in Seattle would be towards the top of my list. Boundary Bay Barrel Aged Scotch Ale – Boundary Bay takes their very solid Scotch Ale and ages it in Dry Fly Whiskey barrels. Whiskey barrels and scotch ales get along very well. Icicle Brewing SnowBockalypse – The still new Icicle Brewing from Leavenworth tries their hand at a traditional doppelbock. Rich, sweet malt and some light warming make the style a perfect winter lager. Snipes Brewing Julekalender Imperial Oatmeal Chocolate Stout – This 8.5% stout from one of Washington’s best breweries sounds promising to me. Black Raven Festivus Seeker – Black Raven takes their uber-popular Wisdom Seeker Double IPA and adds cranberries, ginger, and herbs. This is worth trying just because I’d be interested to see if this infusion results in a beer nearly as good as Wisdom Seeker. Some beers should just be left alone. If this doesn’t do it for you, maybe their Gunpowder Plot Bourbon Nitro Porter will. Hale’s Bourbon Barrel Wee Heavy – The prelim beer list on the festival website doesn’t have any info for the beer Hale’s will be pouring, but I’d expect they will have some of this. Slated for release at the taproom on December 1, this is an outstanding example of how barrels can transform a good beer into a great beer. Foggy Noggin Brewing will be pouring the classic NW Holiday Beer – Christmas Duck (Porter) and our new release – PowderKeg (Coffee Stout) – you can’t miss these great English Ales. Was able to try some really great beer today. The one thing that really annoyed me was that one brewery charged twice as much (maybe other brewers did it too, but I only noticed one brewery who required two tokens for their samples). I didn’t expect this to be like the SIBF, I thought 1 token = 1 sample, but maybe I didn’t read the guidelines carefully enough. I’d really wanted to try those spendy offerings, but instead, I had a second Cozy Sweater from Iron Horse.